The aviation sector currently doubles in size every 15 years. In order to facilitate that growth while at the same time improving safety and security and reducing environmental impact, the EU is financing a project called ‘The Endless Runway’. 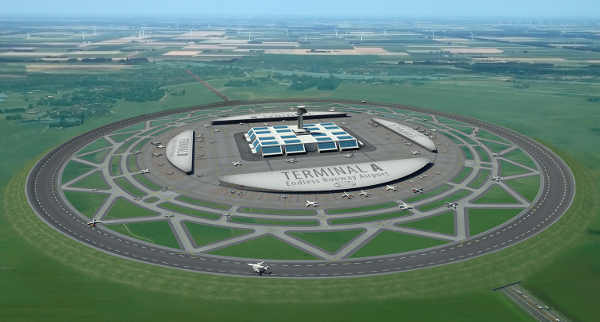 This new airport concept is based on the construction of a circular runway with a diameter of approx. 3.5 km around an airport terminal. Such an airport would take up only a third of the space of a conventional airport. Another advantage is that aircraft would always be able to take off and land independently of the wind direction, since there is always a point without crosswind on the circular runway. Landing aircraft can also be routed away from residential areas because they are not dependent on a standard approach path. Finally, the ‘Endless Runway’ concept will enable multiple aircraft to take off and land simultaneously, resulting in increased airport capacity. The Endless Runway project has been executed by NLR, DLR (Germany), ONERA (France), INTA (Spain) and ILOT (Poland), and has received funding through the EU FP7.